“In this society which urgently needs to educate citizens to be articulate and literate, there is something simple but profound we can all do – we can tell and read stories to children. Far from being a luxury, the story habit establishes in children the sturdy bedrock on which to grow the power of empathy and an educated mind. It starts with enjoyment. Take Tara: Tara’s mom knows Tara loves books. It’s obvious because when they sit down to read, Tara’s eyes twinkle and she waves her arms up and down in anticipation. Tara’s most favourite book is Twinkle Twinkle. She squeals with excitement when she sees the cover and tries to grab the book and chew it! Tara is seven months old and she’s on her way to becoming a reader – in her mother tongue. Can we share the beauty and power of literature through our various languages? Whatever we call them, our mother tongues are the languages we feel at home with – the languages we are comfortable to use. Whether it’s one or a combination doesn’t matter. What matters is feeling a sense of ownership, belonging and strength. By the time we’re five years old, we’ve already used them to learn about and communicate what it means to be human – profound emotions, desires, knowledge, and views about our worlds. As a baby, it’s normal and natural for Tara to visit the library or bookshop regularly with her mom, who chooses what to offer her daughter from shelves of picture books. Over time, they’ll spend hours together playing with images and words that delight them both, whether in a book or on a digital device. Like all babies are able to do, given the chance, Tara will make positive emotional connections to books and stories. She’ll also learn many literacy lessons before she’s even near formal school age. And as she goes through her childhood, it won’t be a problem to find a constant stream of inspiring reading material to suit Tara’s developing tastes. There’s an abundance of what’s needed – and more. But that’s not all. It’s also normal and natural to expect Tara to use her mother tongue for schooling. In fact from the cradle to the end of schooling, and perhaps into university, Tara will have the choice of communicating through her mother tongue. She will learn to read and write in English, and she will never drop it because her school will never stop offering it as a teaching medium. She can, of course, and most likely will learn to read, write and speak other languages, either at the same time or after she has learned to read and write in English. And though she’ll ‘just’ learn these languages as subjects, she might well learn them very well, if she has good teachers. She won’t have to leave her language behind her in the playground as she goes into the school building. Why would she? That wouldn’t be educationally sound, would it? Nor would it be good for her self-esteem to have to ‘start from scratch’ with an unknown language, forcing her to literally scratch around for ways to express herself. This is why mother tongue based education is the norm for English – and some Afrikaans speakers. It doesn’t guarantee success of course, but it provides strong learning foundations. 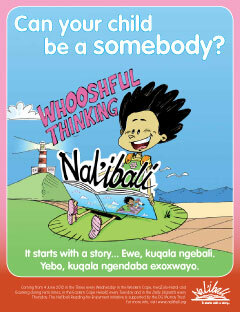 Why are there such different opportunities for African language speaking children – conceptually and practically? Do we expect them to learn to read and write? Do we expect from them the same kind of regular reading that is normal for English speakers? Do we want for them the pleasure of a great read in a language that flows easily and soothes their insecurities or wafts them off to a magical world? If we do, then why are there barely enough books to read to them and for them to read alone for more that a month or two (assuming you find the few noteworthy bookshops or libraries that have them)? Toddlers, preschoolers, primary school age children or teenagers – all quickly run out of reading material in their mother tongue when regular reading is attempted. With the exception of English speakers and some Afrikaans speakers, most young children do not continue using mother tongue in school beyond the first three years. They might switch over to English in Grade 4, and be taught by teachers who themselves do not necessarily know English well at all. Or they might be among the few whose parents can afford to send them to a school with English speaking teachers. The mother tongue based education system that we know is best for all children (we do know that, don’t we?) is made available almost only to the offspring of those of us previously advantaged by apartheid. This is profoundly ironic; so many people have deeply painful memories of mother tongue education or ‘moedertaal onderwys’ – memories that abound with all the intended evil of the apartheid education system. It’s not surprising that so many people still equate reading and writing with English – and a good education with English medium education. But if children are to be hauled out of the deep trough that their education seems to have sunk them into to, then we have to change this perception. Growing into reading in mother tongue and being educated in your mother tongue is appropriate for all children, despite the real challenges around teacher training, terminology development, book creation and provision. It doesn’t have to be an ‘either-or’ matter; it’s both mother tongue and other languages for literature development and educational development. Coming to love stories and other literature is the very substance of becoming literate and it’s a deeply social and cultural process that can start early, and doesn’t end. All families should have the right to expect conditions that allow their children a chance of satisfying and successful learning. In a multilingual society like South Africa, this includes nurturing and looking after the languages people use. The more initiatives like this and those of a similar nature succeed, the more we will have cause to celebrate our mother tongues. Where there’s a will there’s a way: join us! Carole Bloch is the director of PRAESA (The Project for the Study of Alternative Education in SA). I have seen a “sense of ownership” today at Sosebenza Primary School where there is a reading club running on the basis of the book buddy system. One grade 4 learner was reading to a grade R learner. During the reflection session with the older learners, he was explaining so passionately what kind of questions he was asking the little one. The kind of connections they were making just exceptional! We have so much to learn from children. Thank you for this- I always enjoy your articles.